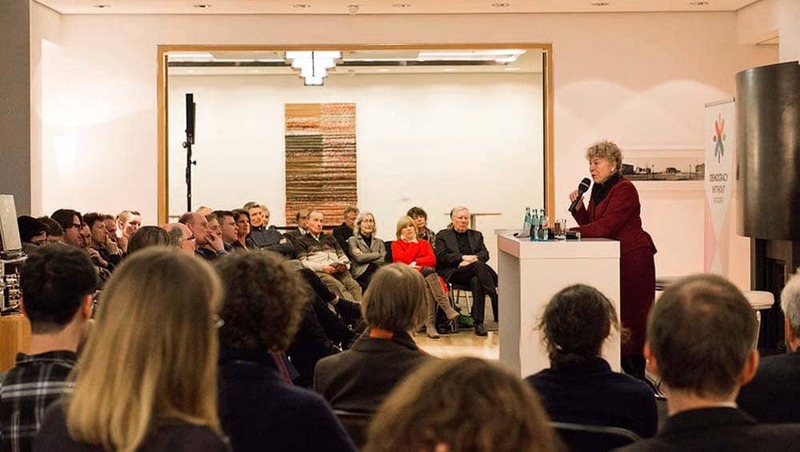 Last Thursday (22 March), the participants in an event at Pariser Platz in Berlin hoped that the establishment of a parliamentary assembly at the UN would provide impetus for a democratic reform of the world organisation. Organized by Democracy Without Borders in collaboration with WeQ Institute, the discussion focused on the threats to democracy posed by political disenchantment, populist groups, global market forces and autocratic governments, and the role of global institutions. Regine Lorenz of Allianz Stiftungsforum spoke of a „World Insecurity Council“ with regard to the impotence of the UN body responsible for maintaining world peace in the face of human rights violations in Syria. Political scientist Gesine Schwan emphasised the need for democratic participation to grow from below and advocated multi-stakeholder approaches. Jo Leinen, Member of the European Parliament, and Andreas Bummel, Director of Democracy Without Borders, advocated a democratisation and strengthening of the United Nations. They argued that the „global democratic deficit“ is also weakening democracy in individual states. Their book „A World Parliament“, published a year ago in German which will be presented in English in New York and Brussels in April, was described by experts as a new standard work on the subject. According to the authors, parliamentarians, opposition politicians and minorities should also have a voice at the UN. So far, only governments are represented there. The international campaign that promotes the idea, coordinated by Democracy Without Borders, is supported by over 1,500 members of parliament and numerous personalities worldwide. The panel agreed that efforts for more democracy from the local to the global level would complement each other. Peter Spiegel of WeQ Institute pleaded for a „new enlightenment“ in the sense of a broad and integrative discussion about a contemporary design of democracy. The slow progress in combating tax evasion and the erosion of corporate taxation through international competition were criticised. It was argued that a UN Parliamentary Assembly would be the right place to conduct a global inquiry and put political pressure on governments. A controversial discussion was held on a question raised by the audience concerning direct-democratic voting at the global level. The event was organised with the support of the Workable World Trust and in cooperation with the German United Nations Association.